It is not surprising that Tuft & Needle mattresses are popular. This bed in a box mattress is vacuum-rolled, boxed, and delivered to your door. Some things you might look for in a bed frame for Tuft & Needle Mattress are durability, design, ease of assembly, and warranty. Here are a few different options with descriptions of their features to help get you started. If you want to stick with the Tuft & Needle brand, you might want to consider this simple and inexpensive metal bed frame. 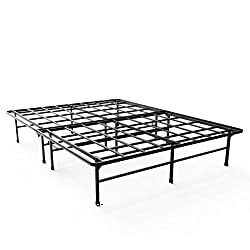 Sturdy and comfortable, the Tuft & Needle Metal Base Bed Frame is made from black colored steel and comes in six sizes. The side panels prevent a box spring from sliding around, and it can be easily assembled without any tools. This is another base made by Tuft & Needle and can be used with the metal base bed frame or with another frame to add height. The Tuft & Needle Mattress Box-foundation has a durable cover made of stone grey woven fabric. It is 7.25 inches high and easily assembled without tools. This platform style bed frame by Zinus, made from steel and wire, does not require a box spring. Simple, sturdy, and strong, it will prevent your mattress from sagging. It is 14 inches high with 13 inches of storage space underneath. It assembles in minutes with no tools required and folds for easy storage. Easy to move, the Zinus SmartBase Mattress Foundation Platform can fit inside of other bed frames or be used on its own. It comes in six sizes and includes plastic caps to protect your floors. If you prefer the look of a wooden bed frame, this slat bed frame by Alsa is a great option. Made from solid Malaysia rubber wood with a beautiful wenge finish, this attractive frame can be used without a box spring. It sits close to the floor, so you won’t find much storage room under this frame. Assembly is required, which takes about half an hour. This wooden bed frame by Nomad is made in the USA from unfinished solid poplar hardwood. The wood is stronger than pine, natural, and hypoallergenic. The Nomad Frame has smooth rounded edges and no sharp corners. Firm in support, it can be used with or without a box spring. Assembly is required. This attractive mattress foundation by Zinus consists of a 9-inch thick sturdy steel frame on 7-inch support legs. The Quick Snap comes with an attractive zippered slipcover. It is packaged compactly, and it can be assembled in twenty minutes. All tools for assembly are included. 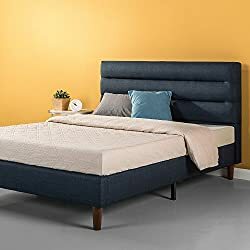 If you are looking for a bed frame with a headboard, this bed frame from Manhattan is a good choice. With a sleek, contemporary design that will fit any room, this low profile frame includes wooden slats and does not require a box spring. The Manhattan Bed frame and headboard and headboard are padded and upholstered in ebony-colored faux leather. 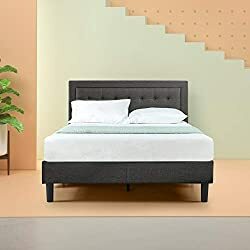 This Finnish platform bed frame by Flex Form is made of metal and has adjustable arched hardwood slats that can be arranged for firm or plush levels. This raised platform bed frame does not need a box spring and can be assembled in minutes without tools. There is a center leg for support, which prevents the mattress from sagging. With 14 inches of clearance space, there is plenty of room for storage under this frame. If you are looking for an affordable adjustable frame, this ergonomic frame from Classic Brands is great option. This Classic Brands Frame features separate ergonomic head and foot elevations, lounge, TV/PC, and zero gravity positions. It also includes three speed dual head and foot massage, USB ports, and a wireless remote. The legs are adjustable for different height options. Getting a good night’s sleep is essential for your health and well-being, so it is important to have the right mattress for your needs and a good bed frame to go with it. The Tuft & Needle mattress is an affordable, comfortable, and supportive mattress that can be conveniently delivered to your home. It is compatible with several different styles of frames that can be purchased easily online, so you can match it with whatever type of foundation you choose. First, you will need to decide what type of base or frame will work best for your needs. Box springs are often used with mattresses to provide extra support and height. Most modern mattresses no longer require box springs because they have enough internal structure and support on their own, but some bed frames still require them. Slatted frames, which can be used without a box spring, provide a low profile, a modern look, and are more breathable, which helps keep the mattress from accumulating moisture and mildew. Usually, slats are made of wood arranged linearly and attached to rubber holders and a metal frame. Slat frames provide support and comfort. For most mattresses, slats should be no more than three inches apart to prevent sagging. Another type of frame that you might consider is an adjustable frame. Adjustable frames allow you to incline different parts of the bed depending on your needs. These bed frames can be ideal for snorers or for people with certain health conditions. They can help with blood circulation, acid reflux, asthma, and back problems. If you are looking for a low-key base, you might consider a bunky board, a low-profile box spring that is closer to ground than a traditional box spring, or a tatami mat for sleeping directly on the floor. Once you choose your base type, the next step is to look at specific frames. Bed frames are made a variety of materials and offer an array of features. It has heat wicking graphite and cooling gel to keep it cool and comes with a plush, breathable cover. CertiPUR US, GreenGuard Gold, and OEKO-TEX certifications guarantee that the mattress is free from harmful chemicals, low on VOCs and off-gassing, and meets requirements for articles worn close to the skin. It comes with a 10-year warranty and a 100-night trial. Tuft & Needle mattresses are priced lower than competitors. They can support any size and weight and are compatible with just about any bed frame including box springs, slatted frames, adjustable frames, bunky boards, and tatami mats. They come in six sizes, twin, twin XL, full, queen, king, and California king. If you are looking for a bed frame to go with your new Tuft & Needle mattress, there are many different options you might want to consider.